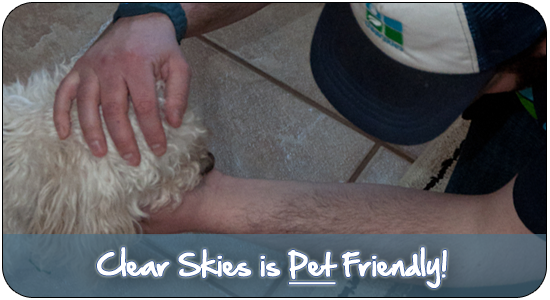 Clear Skies Is Pet Friendly! Unless you’re a “dog person”, or a “cat person” (or a “ferret person”), you just don’t get it. You don’t get how much a part of the family your little furball can and does become, day in, day out, year after year. Well, at Clear Skies Window & Gutter Cleaning, we definitely do get it. We love animals. That’s why we obsess over finding new ways to be even friendlier to your family’s pets. Does your little dog have to stay locked in the laundry room while we’re there? No problem, we’re on it. Would he like a special little treat? Just ask, our pockets are always full of them. Does your back gate have to stay locked, so that they don’t sneak out and dangerously end up on the road in your neighborhood while we’re working around your home? Cool, we’ll make sure they stay safe and sound in your backyard. Are you worried about your pet being exposed to potentially harmful cleaning chemicals, like some of those other window cleaning companies use? Don’t worry, Clear Skies Window & Gutter Cleaning insists on using only mild, pet-friendly detergents and surfactants, so that your furballs are never in any danger from toxic exposure, and you can stop worrying. Your pets are a big part of your family. That’s why Clear Skies Window & Gutter Cleaning has a “pet-friendly protocol” in place, ensuring that your pets are always accounted for, safe and secure, and given a little special warm human contact while our friendly crew is on your property. If you’re an “animal person”, then we’ve got something in common. Actually, quite a bit. Please call or text 780-995-1181 right now for your free, no obligation estimate, and discover the difference that insisting on the pet-friendly window cleaners at Clear Skies Window & Gutter Cleaning can make in your life! 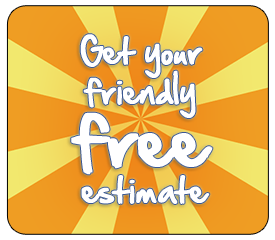 Or click on the button on the right to use our easy-price estimate guides right now, to get a ballpark idea of how much your home’s window or gutter cleaning service might cost.